We recount you about Alcantara Gorges, a corner of land placed nearby Taormina. It is crossed by Alcantara river (from Arabic Qantarah “the bridge”) which is an important river in Sicily. Its source it is located 1250 meters above sea level in Floresta district. This river follows a way of 53 km long, and crosses many places, including Etna , first of flowing into the Ionic Sea, in Giardini Naxos. 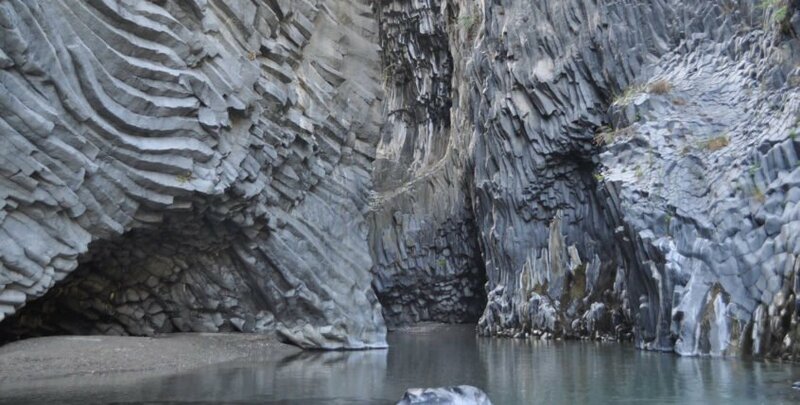 Also the history of Alcantara Gorges is a fascinating mix between myths and reality and as other Sicilian legends, it is tied to other lands all over the word. Its birth has a clear scientific reason, it is a result of a volcanic eruption (third millennium b.C.) whose lava flowed obstructing the way of the Alcantara river. The strength of the water and especially the gelid temperature of it, results in basalts whose columns shapes the actual “Gorges”, really a little canyon. As always, people turned to Gods that, in that case, because of the dishonesty of a local farmer, they became angry and they unleashed a terrible eruption that created this spectacle of nature. Today, Alcantara Gorges can be perfectly visited thanks to the evolution of annexed first quality services. It is also possible do sportive activities. For the protection of this river, in 2001 it was established the Alcantara Gorges river Park. As said before, talking about the correlation between these places and other places around the world, we can find basalt columns like those who are in Alcantara gorges also in other places like in the Cobbled of the Giants (Ireland), in Staffia (Scotland) and in many other places. The extraordinary thing is that in all cases reference is made to the “Giants” that for us, here in Sicily, are Kiklops (The cyclops). And if they aren’t just figment of our imagination? Have a nice tour, with a good company of Giants.